I have some quick and easy Hair Hacks to share with you today that can help make your hair look better, save money on hair products, and help you organize your hair supplies! Ladies, this is for you! My favorite is number 5, try it on yourself or your daughter! 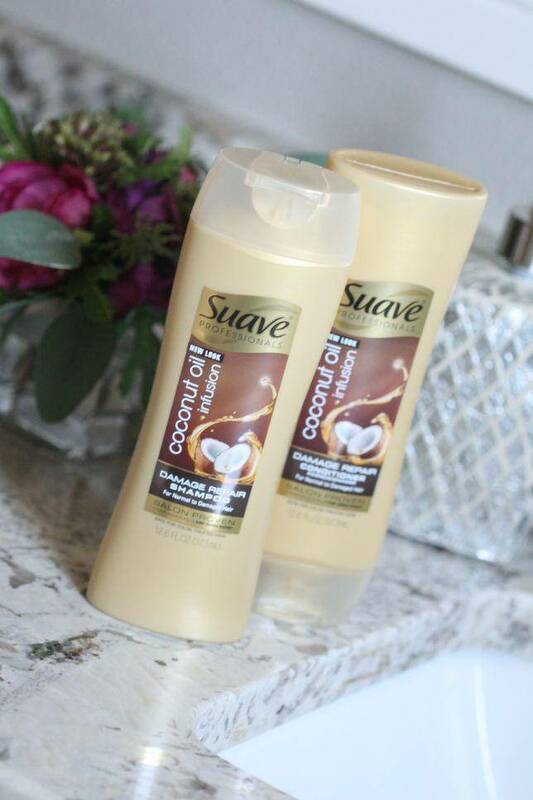 I personally love Suave hair products. You pay a fantastic low price, but they are like salon-quality products! You actually get more than what you pay for! With the 5 Premium lines that Suave carries surely one of them will be just what you need for your hair! Coconut Oil Infusion and Sea Mineral Infusion are my two favorites. The Sea Mineral Infusion line smells fantastic! The other three lines are Keratin Infusion, Biotin Infusion and Moroccan Infusion! Which ones have you tried? My daughter loves Suave shampoo and conditioner, and I love that even if she wastes some, my pocket-book isn’t taking a hit! I have really fine hair and like the look of a full ponytail, but my hair alone can’t quite look full. Using a small clip, put it under your ponytail. Then rat your hair just above the clip and hair spray it. You will want to leave the clip in your hair to help hold it up a little bit more, but just make sure the clip is covered up. I would suggest buying a clip that closely matches your hair color. This is quick and easy, and makes a big difference. You can also put your hair in a ponytail and pull the top half of the ponytail up, stick the clip in, rat your hair and spray as an alternative. Try both and see which one you like better! 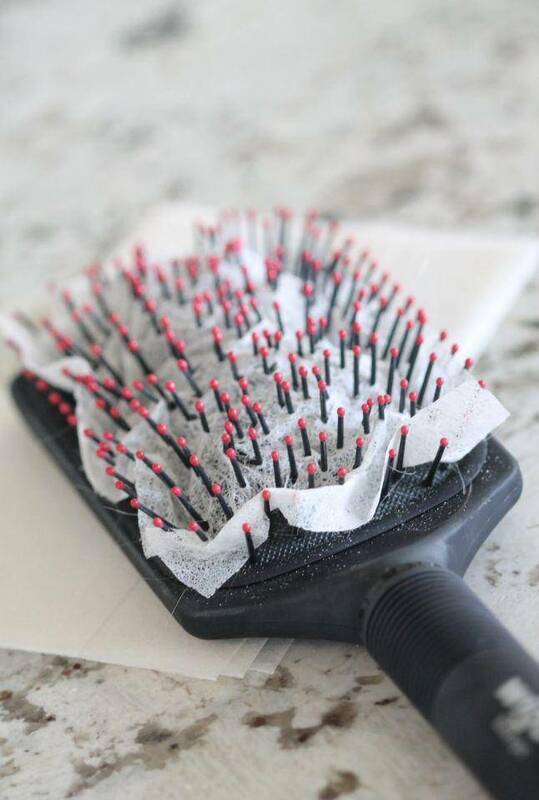 If you have fly-aways, stick a dryer sheet over your hairbrush when you brush through your hair. This will help those little hairs that won’t stay in place lay where they are supposed to. You can also just take a dryer sheet in your hand and run it over your hair if you’re in a hurry. Plus, this makes your hair smell great also! 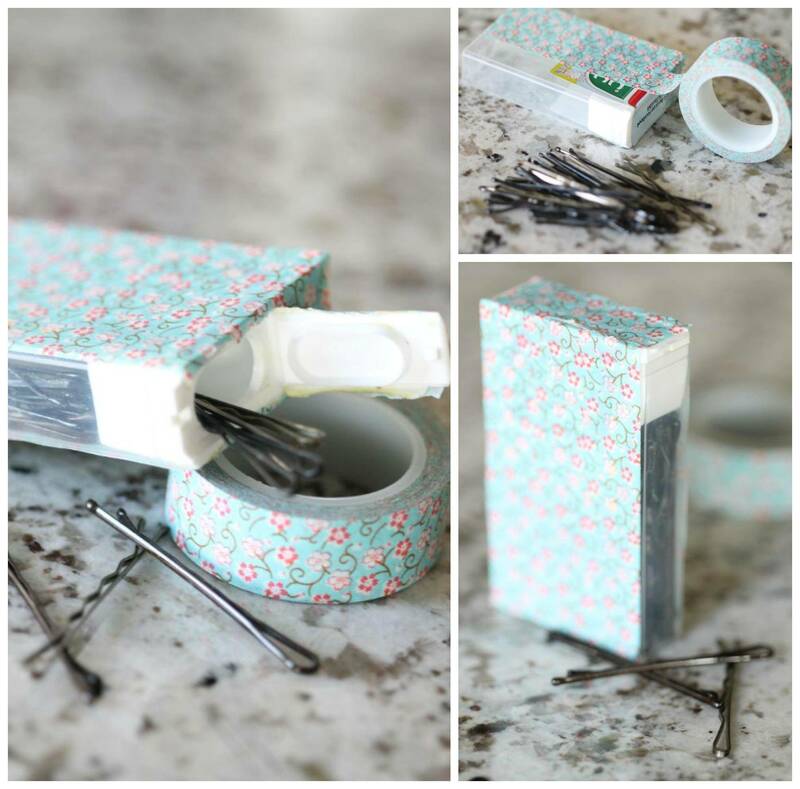 Storing your loose Bobby Pins in an emptied candy container can help keep your pins organized. You can use some cute Washi Tape to decorate the case too. Bobby pins can be a mess if not kept in some sort of container and this is the perfect container to pop open and dump out the exact amount you need. Find an old sock that’s close to your hair color. Next put your hair in a ponytail. Wrap the sock around the ponytail and stick the end of the sock back into the wrapped sock. Spread the hair all the way over the sock so it’s covered and secure with another ponytail holder. Then wrap the loose ends around to cover the ponytail holder and secure with bobby pins. This works best for long hair styles, but you can give it a whirl with medium length styles too! Spray it with a little hairspray to hold it in place. Surely I’m not the only one with a mess of ponytail holders in my drawer. Using a Carabiner Clip is a fantastic way to keep your hair ties organized. Plus, you can grab and go if you are packing or need to take them somewhere with you. My little girl had a dance recital this weekend and I wish I had thought of this earlier. We pull back part of her hair so it’s out of her face and using bobby pins is the best way to do that. Giving them a little “grit” with hairspray helps them stay in place! I’m going to have to remember that for our next recital! If your hair is prone to sticking up in areas try running a makeup brush (that you only use on your hair) over your hair after you’ve sprayed hair spray on it. 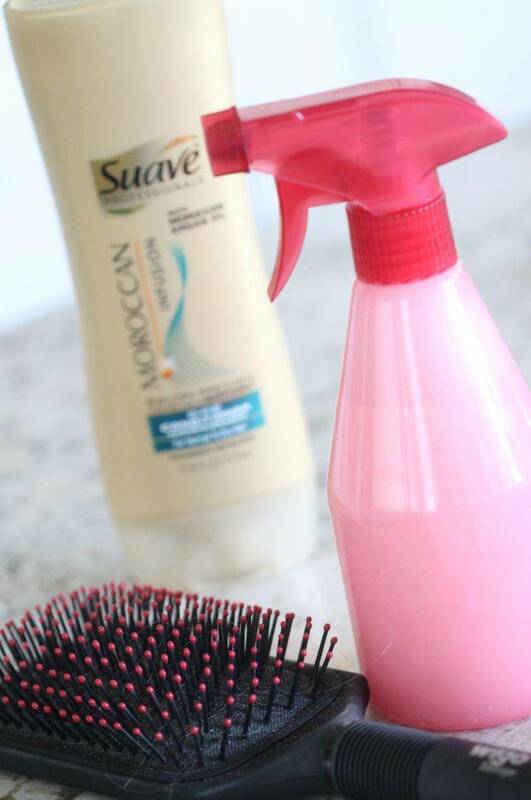 This will help tame your fly-aways and will give your hair an overall nice finished look. If you don’t have Dry Shampoo on hand, or just don’t buy it, Cornstarch can do the trick. You know there are days when you just don’t have time to wash, dry and style your hair and you’re in a hurry! Just sprinkle a little on your greasy areas and let it sit for a minute. 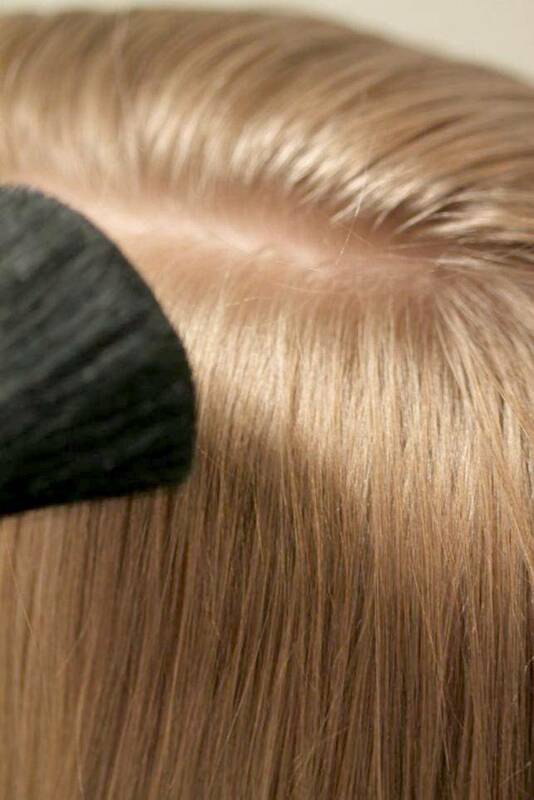 Then brush through it like you would if you were using dry shampoo. If your hair is light this will work well for you. If you have dark hair, since cornstarch is a light color you may need to add cocoa to it, if you dare! Although that may entice my tastebuds to want to eat chocolate All.Day.Long. I find myself in need of detangler and don’t want to run to the store. Make your own! Here’s how. Combine about 2 Tablespoons of conditioner per 8oz of water. You can use more or less depending on your results. You can add the mixture to any spray bottle. You can even use an empty hair detangling spray pump bottle. Just rinse it out and you’re good to go. The spray bottle is actually easier for kids to use rather than pushing their finger down on the top of the regular detangler pumps! For more DIY ideas check out my Do It Yourself page! Disclosure: This post is sponsored by Lunchbox, however all thoughts and opinions are my own. Instead of a carabiner, I use a safety pin! Same concept, great idea! Beach Packing List | 12 Things You Don’t Want to Forget!